GAZPROM Germania and Polish bus manufacturer Solbus are bringing natural gas-powered public transport to the streets of Warsaw with their recent launch of 35 Liquefied Natural Gas (LNG) buses. The project partners, together with distribution partner Lider Trading, won a public tender to supply the LNG buses late 2013, issued by Warsaw’s municipal transport company Miejskie Zakłady Autobusowe sp. z o.o. (MZA). GAZPROM Germania is both supplying the LNG for and providing for the refuelling of an initial group of 35 Solbus Solcity Euro 6 urban buses. 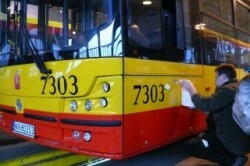 The companies previously launched Europe’s first 11 LNG city buses in the Polish city of Olsztyn in October 2013. “Natural gas-powered buses both emit significantly fewer pollutants than comparable diesel buses and have motors that are significantly quieter, which is particularly welcome in the inner city. That’s why we and our Polish partner Solbus want to convince more customers of the benefits of natural gas for transport”, says Timo Vehrs, Director of Business Development at GAZPROM Germania GmbH. The city of Warsaw stands to benefit from using LNG, which is an environmentally friendly and cost-effective alternative fuel for public transport. “Natural gas-powered buses are a very tangible solution for eco-friendly public transport in Warsaw. Natural gas is considerably cheaper. Using natural gas also makes us less dependent on oil”, says MZA spokesperson Adam Stawicki. The company anticipates a 35% fuel cost reduction compared to its other conventionally fuelled buses. LNG has the same environmental benefits as CNG, but being more volumetric-efficient, it allows carrying 2.5 times more gas in the same-size fuel tank compared to CNG. It makes possible longer travel distance on a single tank and decreases the weight of the bus. Gazprom is providing a mobile refuelling vehicle from Germany until the LNG filling station is commissioned at the MZA Ostrabramska Depot in the Warsaw district of Praga Południe.